11,219 kilometres, two proud parents, and one high-achieving BCIT grad. That’s the trifecta that made June 21, 2018 a very special day for the Simões family. 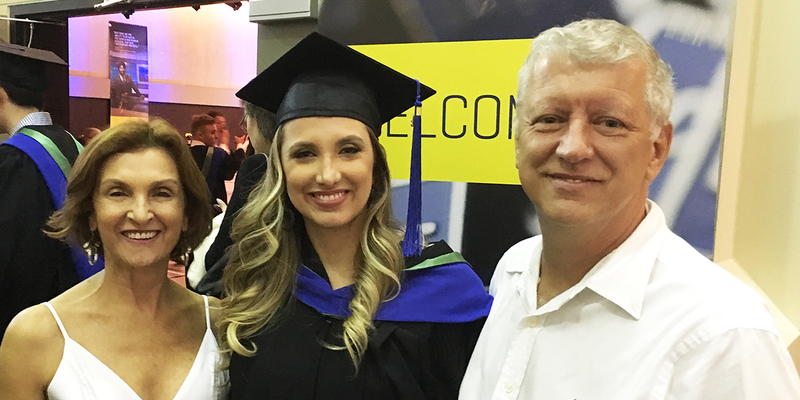 It was Mariana Simões’ graduation day from BCIT’s Business Management diploma program, and her parents had travelled from Rio de Janeiro to see their daughter officially become a BCIT alumna. Two years ago, Mariana, who had lived in Brazil all her life, decided to move to Canada and study business at BCIT. While Mariana was confident she was making the right decision, she was still nervous about leaving her family, friends, and home to study in new country. When she arrived in Vancouver with her husband (they married just one month before moving to Canada), Mariana says her new classmates in the Business Management program made her adjustment to life on the West Coast much easier. Her fellow students—many of them also recent transplants from Brazil—became her family here. Among friends and classmates, this kind of caring is to be expected. What Mariana didn’t expect was a similar kind of caring from her BCIT instructors. Mariana’s hard work at BCIT did not go unrewarded. In October 2017, she was presented with the BCIT Alumni Association Award, which is given to students based on academic standing and involvement in school or community activities. Now a BCIT graduate, Mariana is excited about the future. While she misses the warm weather and postcard-perfect beaches of Brazil, she says she looks very forward to building a life and career in Vancouver. Congratulations, Mariana and all BCIT’s newest graduates! You join the ranks of more than 180,000 proud alumni here and around the globe. Learn more about BCIT’s School of Business and Business Management diploma program.